Though a scheme may spend months incubating in the shadows, there is a moment of terrifying revelation when your plans come to fruition�a grand reveal that shatters your foes beyond repair. For the secret alliance of House Frey, House Bolton, and House Lannister, that moment was the Red Wedding. In a single night, House Stark suffered a devastating defeat, and though Robb Stark had won every battle, he met his demise beneath the roof of his supposed allies. 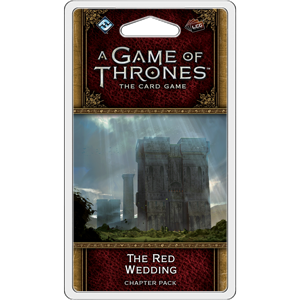 With The Red Wedding Chapter Pack for A Game of Thrones: The Card Game, you�ll have the chance to continue the saga of A Storm of Swords with one of the most gut-wrenching and iconic moments of the entire series. Even as you walk among the fallen and the deadly power of House Frey continues to grow, you�ll also find new ways to spend and earn your gold, like the other expansions of the Blood and Gold cycle,. With iconic characters like Ellaria Sand, Strong Belwas, Othell Yarwyck, and Walder Frey entering the game for the first time, The Red Wedding brings new horrors and schemes into every game.